Nearly three decades ago, Chinese interpreter Yang Jiechi witnessed a historic event in a small brick building on 2300 Connecticut Avenue, Washington D.C. The opening of the Chinese embassy in the US capital marked the beginning of formal diplomatic ties between the two countries in 1979. On Tuesday morning, Yang, who is now foreign minister, experienced another milestone in bilateral ties - this time by unveiling a new embassy office, the largest of its kind in Washington. At the office's opening ceremony, attended by senior US officials including Treasury Secretary Henry Paulson and Deputy Secretary of State John Negroponte, Yang said the completion of the new 1.076-hectare complex was a "landmark event" reflecting the sound presence and bright future of Sino-US relations. "The Sino-US relationship has become one of the most important bilateral relations in the world and is incomparable from what it was in terms of either depth or strategic connotation," Yang said. US Labor Secretary Elaine Chao, who also attended the ceremony, said: "The move from the previous building to this impressive new complex is emblematic of China's growing presence on the world stage." China's new embassy complex is already a landmark in Washington's International Drive, a park-like diplomatic enclave where 15 other embassies are located. Designed by renowned Chinese American architect I. M. Pei, the new complex boasts a sweeping entrance hall, multiple skylights, angular rooftops and traditional Chinese rock gardens sculpted into the terraced land, the International Herald Tribune described in a report in May. 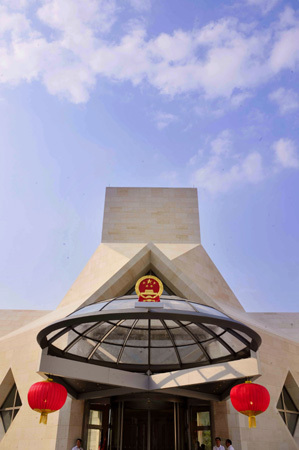 The Chinese government had only one specific request for the design - that it "convey the sense of importance of China and China's role in the world today", the newspaper quoted Pei's son, Chien Chung Pei, as saying. He told the paper that the design "takes its inspiration from traditional Chinese planning principles and reinterprets them into a thoroughly new and contemporary form". The new embassy office reportedly took hundreds of construction workers more than three years to construct. It "provides far more than more extra elbowroom", said an article in the San Francesco Chronicle. "It is a physical declaration in steel and stone that China has now become a major world power and wants to have its presence felt in the capital of the world's last remaining superpower," it read. "In the period since China moved into the current embassy, some 25 years ago, we've witnessed spectacular change, not only in the complexity of US-China relations but in the growth of China's importance itself," Bates Gill, a former China specialist at the Center for Strategic and International Studies in Washington, told the Tribune. "We see that reflected in the way they want to be seen," he said. At the other end of the Pacific, a new US embassy office in Beijing's Chaoyang district is also being built. US President George W. Bush is widely expected to open the 5.6-hectare complex on Aug 8 when he attends the Olympics. The new compound is said to be the largest single construction project undertaken by the US State Department on foreign soil. "Both countries devoted a lot to the building of the new chanceries," said Shen Dingli, director of Fudan University's American studies department. "From this, we can see how much importance they have attached to relations with each other," Shen said. "The new chanceries will not only change the skylines in the two cities' diplomatic districts. They will reflect the two countries' will to refine their images with each other amid evolving bilateral relations."